‘The Americans’ star Matthew Rhys gets candid about life with his co-star and girlfriend, Keri Russell, his experience guest starring on ‘Girls,’ & what he learned from Sally Field. Plus, the Welsh actor gives Larry a lesson in accents and sound effects. 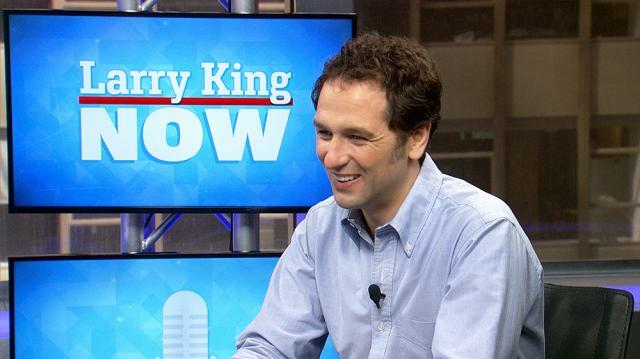 Larry King interviews Matthew Rhys, a BAFTA-winning actor who has been nominated for the Golden Globe, Emmy, and Critics Choice awards. Rhys has performed in the series ‘Brothers & Sisters,’ the film ‘The Edge of Love,’ and ‘The Wine Show,’ and currently stars in the FX drama ‘The Americans,’ now in its fifth season. Larry asks him about playing a Russian posing as an American on the show, when Rhys is a Welshman, and Rhys talks about his role and being influenced by American television. Rhys confirms he is shocked by some of the true storylines in ‘The Americans,’ and agrees that it’s fundamentally a marriage story with universal themes. Larry asks how he got the role, and Rhys attributes it to a series of flukes that ended with the casting director approaching him backstage after a play. From the professional, Larry pivots to Rhys’ personal life, which is intermingled with his work since Rhys is in a relationship with his ‘The Americans’ costar Keri Russell. Rhys says there are great pros and great cons to working with someone he lives with, especially since they act on the same show. Larry asks how Rhys got his start in acting, and Rhys talks about the arts being big in Wales and in his family. Trained at the Royal Academy of Dramatic Art in London, Rhys speaks about his early success, which included working with Peter Falk on the last episode of the series ‘Columbo.’ Larry asks Rhys about another successful series he did, ‘Brothers & Sisters,’ and Rhys gushes about working with Sally Fields, who taught him life lessons in film and television. As part of the film and television industry, Rhys says he loves working in America, though he struggles with the concept of “home.” However, he now considers New York his home, and Larry asks what he thinks about American politics and Trump. These are sad times, Rhys says, and particularly despairs over the damage to the environment. The political talk turns back to professional endeavors, and Larry asks about Rhys’ guest spot on ‘Girls.’ Rhys recalls that Lena Dunham thought he’d be perfect for the role of a sexual predator, and says that he enjoyed the conflict and challenge. Larry asks if he has a dream role, and Rhys mentions there’s a Welsh version of ‘Braveheart’ he’d love to see made. The real challenge for Rhys though is ‘Hamlet,’ a dream role which he compares to climbing Everest.